Electromagnetic fields from powerlines, cell phones, cell towers and wireless impacts the birds, bees, wildlife and our environment. Below is just a small example of the critical research that has been done on this issue. -The Department of Interior in a 2014 letter on the impact of cell towers on migratory birds. Cucurachi, C., et al. “A review of the ecological effects of radiofrequency electromagnetic fields (RF-EMF).” Environment International, vol. 51, 2013, pp. 116–40. A Review of 113 studies from original peer-reviewed publications. RF-EMF had a significant effect on birds, insects, other vertebrates, other organisms and plants in 70% of the studies. Development and reproduction of birds and insects are the most strongly affected endpoints. Balmori, A. “Electrosmog and species conservation.” Science of the Total Environment, vol. 496, 2014, pp. 314-6. Manville, Albert M. “A BRIEFING MEMORANDUM: What We Know, Can Infer, and Don’t Yet Know about Impacts from Thermal and Non-thermal Non-ionizing Radiation to Birds and Other Wildlife.” Wildlife and Habitat Conservation Solutions, 2014. Research clearly shows that Bees and Butterflies are sensitive to electromagnetic fields. Cammaerts, Marie-Claire. “Is electromagnetism one of the causes of the CCD? A work plan for testing this hypothesis.” Journal of Behavior, vol. 2, no. 1, 2017, pp. 1006. The decline of domestic bees all over the world is an important problem still not well understood by scientists and beekeepers, and far from being solved. Its reasons are numerous: among others, the use of pesticides and insecticides, the decrease of plant diversity, and bee’s parasites. Besides these threats, there is a potential adverse factor little considered: manmade electromagnetism. The present paper suggests two simple experimental protocols for bringing to the fore the potential adverse effect of electromagnetism on bees and to act consequently. The first one is the observation of bees’ avoidance of a wireless apparatus; the second one is the assessment of colonies’ strength and of the intensity of the electromagnetism field (EMF) surrounding them. If bees avoid a wireless apparatus, if hives in bad health are located in EMF of a rather high intensity, it can be presumed that bees are affected by manmade electromagnetism. This should enable searching for palliative measures. Goldsworthy, Andrew. “The Birds, the Bees and Electromagnetic Pollution: How electromagnetic fields can disrupt both solar and magnetic bee navigation and reduce immunity to disease all in one go.” 2009. Many of our birds are disappearing mysteriously from the urban environment and our bees are now under serious threat. There is increasing evidence that at least some of this is due to electromagnetic pollution such as that from cell towers, cell phones, DECT cordless phones and Wifi. It appears capable of interfering with their navigation systems and also their circadian rhythms, which in turn reduces their resistance to disease. The most probable reason is that these animals use a group of magnetically-sensitive substances called cryptochromes for magnetic and solar navigation and also to control the activity of their immune systems. Guerra, Patrick A., Robert J. Gegear, and Steven M. Reppert. “A magnetic compass aids monarch butterfly migration.” Nature Communications, vol. 5, no. 4164, 2014. Kumar, Neelima R., Sonika Sangwan, and Pooja Badotra. “Exposure to cell phone radiations produces biochemical changes in worker honey bees.” Toxicol Int., 18, no. 1, 2011, pp. 70–2. The present study was carried out to find the effect of cell phone radiations on various biomolecules in the adult workers of Apis mellifera L. The results of the treated adults were analyzed and compared with the control. Radiation from the cell phone influences honey bees’ behavior and physiology. There was reduced motor activity of the worker bees on the comb initially, followed by en masse migration and movement toward “talk mode” cell phone. The initial quiet period was characterized by rise in concentration of biomolecules including proteins, carbohydrates and lipids, perhaps due to stimulation of body mechanism to fight the stressful condition created by the radiations. At later stages of exposure, there was a slight decline in the concentration of biomolecules probably because the body had adapted to the stimulus. Favre, Daniel. “Mobile phone induced honeybee worker piping.” Apidologie, vol. 42, 2011, pp. 270-9. Electromagnetic waves originating from mobile phones had a dramatic impact on the behavior of the bees, namely by inducing the worker piping signal. In natural conditions, worker piping either announces the swarming process of the bee colony or is a signal of a disturbed bee colony. Warnke, Ulrich. “Birds, Bees and Mankind: Destroying Nature by ‘Electrosmog’.” Competence Initiative for the Protection of Humanity, Environment and Democracy, Brochure 1, 2009. Bees pollinate approximately 1/3 of all crops and they are disappearing by the millions. Warnke raises the concern that the dense, energetic mesh of electromagnetic fields from wireless technologies may be the cause. Sharma, V.P. and N.K. Kumar. “Changes in honeybee behaviour and biology under the influence of cellphone radiations.” Current Science, vol. 98, no 10, 2010, pp. 1376-8. “Briefing Paper on the Need for Research into the Cumulative Impacts of Communication Towers on Migratory Birds and Other Wildlife in the United States.” Division of Migratory Bird Management (DMBM), U.S. Fish & Wildlife Service, 2009. Of concern to DMBM are the potential impacts of radiation on bird populations.For example, preliminary research on wild birds at cellular phone tower sites in Spain showed strong negative correlations between levels of tower-emitted microwave radiation and bird breeding, nesting, and roosting in the vicinity of the electromagnetic fields. Harst, Wolfgang Harst, Jochen Kuhn and Hermann Stever. “Can Electromagnetic Exposure Cause a Change in Behaviour? Studying Possible Non-thermal Influences on Honey Bees – An Approach Within the Framework of Educational Informatics.” Acta Systemica-IIAS International Journal, vol 6, no. 1, 2006, pp. 1-6. A pilot study on honeybees testing the effects of non-thermal, high frequency electromagnetic radiation on beehive weight and flight return behavior. In exposed hives, bees constructed 21% fewer cells in the hive frames after 9 days than those unexposed. Sainudeen, Sahib.S. “Electromagnetic Radiation (EMR) Clashes with Honey Bees.” International Journal of Environmental Sciences, vol. 1, no. 5, 2011. Six colonies of honeybees ( Apis mellifera ) were selected. Three colonies were selected as test colonies (T1,T2&T3) and the rest were as control (C1,C2&C3). The test colonies were provided with mobile phones in working conditions with frequency of 900 MHz for 10 minutes for a short period of ten days. After ten days the worker bees never returned hives in the test colonies. The massive amount of radiation produced by mobile phones and towers is actually frying the navigational skills of the honey bees and preventing them from returning back to their hives. “The potential dangers of electromagnetic fields and their effect on the environment.” Council of Europe Parliamentary Assembly, resolution 1815, 2011. 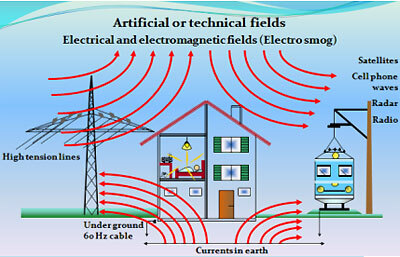 As regards standards or threshold values for emissions of electromagnetic fields of all types and frequencies, the Assembly strongly recommends that the ALARA (as low as reasonably achievable) principle is applied, covering both the so-called thermal effects and the athermic or biological effects of electromagnetic emissions or radiation. Moreover, the precautionary principle should be applied when scientific evaluation does not allow the risk to be determined with sufficient certainty. Kimmel, Stefan, et al. “Electromagnetic radiation: influences on honeybees (Apis mellifera).” IIAS-InterSymp Conference, 2007. 39.7% of the non-irradiated bees had returned to their hives while only 7.3% of the irradiated bees had. Gegear, Robert J. et al. “Animal Cryptochromes Mediate Magnetoreception by an Unconventional Photochemical Mechanism.” Nature, vol. 463, no. 7282, 2010, pp. 804. Oschman, James and Nora Oschman. “Electromagnetic communication and olfaction in insects.” Frontier Perspectives, 2004. “Report on Possible Impacts of Communication Towers on Wildlife Including Birds and Bees.” Ministry of Environment and Forest, Government of India, 2010. This report details the on impacts of communication towers on wildlife including birds and bees submitted to MoEF. It warns of harmful radiation and recommends special laws to protect urban flora & fauna from threats radiation emerging from mobile towers. Sivani, S., and D. Sudarsanam. “Impacts of radio-frequency electromagnetic field (RF-EMF) from cell phone towers and wireless devices on biosystem and ecosystem – A Review.” Biology and Medicine, vol. 4, no. 4, 2012, pp. 202–16. There is an urgent need for further research and “of the 919 research papers collected on birds, bees, plants, other animals, and humans, 593 showed impacts, 180 showed no impacts, and 196 were inconclusive studies”. Schwarze, S.,, et al. “Weak Broadband Electromagnetic Fields are More Disruptive to Magnetic Compass Orientation in a Night-Migratory Songbird (Erithacus rubecula) than Strong Narrow-Band Fields.” Front Behav Neurosci., vol. 10, no. 55, 2016. Magnetic compass orientation in night-migratory songbirds is embedded in the visual system and seems to be based on a light-dependent radical pair mechanism. Recent findings suggest that both broadband electromagnetic fields ranging from ~2 kHz to ~9 MHz and narrow-band fields at the so-called Larmor frequency for a free electron in the Earth’s magnetic field can disrupt this mechanism. However, due to local magnetic fields generated by nuclear spins, effects specific to the Larmor frequency are difficult to understand considering that the primary sensory molecule should be organic and probably a protein. We therefore constructed a purpose-built laboratory and tested the orientation capabilities of European robins in an electromagnetically silent environment, under the specific influence of four different oscillating narrow-band electromagnetic fields, at the Larmor frequency, double the Larmor frequency, 1.315 MHz or 50 Hz, and in the presence of broadband electromagnetic noise covering the range from ~2 kHz to ~9 MHz. Our results indicated that the magnetic compass orientation of European robins could not be disrupted by any of the relatively strong narrow-band electromagnetic fields employed here, but that the weak broadband field very efficiently disrupted their orientation. Engels, S. et al. “Anthropogenic electromagnetic noise disrupts magnetic compass orientation in a migratory bird.” Nature, vol. 509, 2014, pp. 353–6. Balmori A. “Possible Effects of Electromagnetic Fields from Phone Masts on a Population of White Stork (Ciconia ciconia).” Electromagn Biol Med, vol. 24, no. 2, 2005, pp. 109-19. Interesting behavioral observations of the white stork nesting sites located within 100m of one or several cell site antennas were carried out. These results are compatible with the possibility that microwaves are interfering with the reproduction of white storks and would corroborate the results of laboratory research by other authors In far away areas, where the radiation decreases progressively, the chronic exposure can also have long term effects. Effects from antennas on the habitat of birds are difficult to quantify, but they can cause a serious deterioration, generating silent areas without male singers or reproductive couples. Kavokin, K., et al. “Magnetic orientation of garden warblers (Sylvia borin) under 1.4 MHz radiofrequency magnetic field.” Journal of the Royal Society, Interface, vol. 11, no. 97, 2014. Cammaerts, M.C. and Johansson, O. “Ants can be used as bio-indicators to reveal biological effects of electromagnetic waves from some wireless apparatus.” Electromagnetic Biology and Medicine, vol. 33, no. 4, 2014, pp. 282-8. Margaritis, L.H., et al. “Drosophila oogenesis as a biomarker responding to EMF sources.” Electromagnetic Biology and Medicine, vol. 33, no. 3, 2014, pp. 165-89. A total of 280 different experiments were performed. Exposure to wireless devices such as WiFi, baby monitors, and phones created statistically significant effects regarding reproduction and cell death apoptosis induction, even at very low intensity levels (0.3 V/m bluetooth radiation), well below ICNIRP’s guidelines. Balmori, A. “Mobile phone mast effects on common frog (Rana temporaria) tadpoles.” Electromagnetic Biology and Medicine, vol. 29, no. 1-2, 2010, pp. 31-5. The Caribbean spiny lobster,Panulirus argus, is a migratory crustacean that uses Earth’s magnetic field as a navigational cue, but how lobsters detect magnetic fields is not known. Magnetic material thought to be magnetite has previously been detected in spiny lobsters, but its role in magnetoreception, if any, remains unclear. As a first step toward investigating whether lobsters might have magnetite-based magnetoreceptors, we subjected lobsters to strong, pulsed magnetic fields capable of reversing the magnetic dipole moment of biogenic magnetite crystals. Lobsters were subjected to a single pulse directed from posterior to anterior and either: (1) parallel to the horizontal component of the geomagnetic field (i.e., toward magnetic north); or (2) antiparallel to the horizontal field (i.e., toward magnetic south). An additional control group was handled but not subjected to a magnetic pulse. After treatment, each lobster was tethered in a water-filled arena located within 200 m of the capture location and allowed to walk in any direction. Control lobsters walked in seemingly random directions and were not significantly oriented as a group. In contrast, the two groups exposed to pulsed fields were significantly oriented in approximately opposite directions. Lobsters subjected to a magnetic pulse applied parallel to the geomagnetic horizontal component walked westward; those subjected to a pulse directed antiparallel to the geomagnetic horizontal component oriented approximately northeast. The finding that a magnetic pulse alters subsequent orientation behavior is consistent with the hypothesis that magnetoreception in spiny lobsters is based at least partly on magnetite-based magnetoreceptors. Harkless, Ryan, Muntather Al-Quraishi and Mary C. Vagula. “Radiation hazards of radio frequency waves on the early embryonic development of Zebrafish.”SPIE Proceedings, vol. 9112, 2014. With the growing use of wireless devices in almost all day-to-day activities, exposure to radio-frequency radiation has become an immediate health concern. It is imperative that the effects of such radiation not only on humans, but also on other organisms be well understood. In particular, it is critical to understand if RF radiation has any bearing on the gene expression during embryonic development, as this is a crucial and delicate phase for any organism. Owing to possible effects that RF radiation may have on gene expression, it is essential to explore the carcinogenic or teratogenic properties that it may show. This study observed the effects of RF radiation emitted from a cellular telephone on the embryonic development of zebrafish. This study observed the effects of RF radiation emitted from a cellular telephone on the embryonic development of zebra fish. The expression of the gene shha plays a key role in the early development of the fish. This gene has homologs in humans as well as in other model organisms. Additionally, several biomarkers indicative of cell stress were examined: including lactate dehydrogenase (LDH), superoxide dismutase (SOD), and lipid peroxidation (LPO). Results show a significant decrease in the expression of shha, a significant decrease in LDH activity. There was no significant increase in SOD and LPO activity. Li, Ying, et al. “Extremely Low-Frequency Magnetic Fields Induce Developmental Toxicity and Apoptosis in Zebrafish (Danio rerio) Embryos.” Biological Trace Element Research, vol. 162, no. 1, 2014, pp. 324-32. In conclusion, the overall results demonstrated that ELF-MF exposure has detrimental effects on the embryonic development of zebrafish by affecting the hatching, decreasing the heart rate, and inducing apoptosis, although such effects were not mortal threat. The results also indicate that zebrafish embryos can serve as a reliable model to investigate the biological effect of ELF-MF. Takebe, Arika, et al. “Zebrafish respond to the geomagnetic field by bimodal and group-dependent orientation.”, Scientific Reports, vol 2, no. 727, 2012. In this study, we found that zebrafish, a model organism suitable for genetic manipulation, responded to a magnetic field as weak as the geomagnetic field. Baker, R.R., J.G. Mather and J.H. Kennaugh. “Magnetic bones in human sinuses.” Nature, vol. 301, no. 5895, 1983, pp. 79-80. Evidence continues to accumulate that a wide range of organisms, from bacteria to vertebrates, can detect and orient to ambient magnetic fields (for examples see refs 2-4). Since the discovery that magnetic orientation by bacteria was due to the presence within the organism of magnetic particles of the ferric/ferrous oxide, magnetite, the search has begun for other biogenic deposits of inorganic magnetic material and ways in which the possession of such material might confer on the organism the ability to orient to ambient magnetic fields. Such magnetic material, often identified as magnetite, has been discovered in bees, homing pigeons, dolphins and various other organisms, including man. A variety of hypotheses for the use of magnetite in magnetic field detection have been proposed. We report here that bones from the region of the sphenoid/ethmoid sinus complex of humans are magnetic and contain deposits of ferric iron. The possible derivations and functions of these deposits are discussed. Malkemper, E.P., et al. “Magnetoreception in the wood mouse (Apodemus sylvaticus): influence of weak frequency-modulated radio frequency fields.”Scientific Reports, vol. 4, no. 9917, 2015. In sum, we show that wood mice possess a magnetic sense that they use to position their nests along the NNE-SSW axis relative to the magnetic field. The NNE-SSW preference was not altered by RF fields delivered at the Larmor frequency, but was shifted by approximately 90° by a RF frequency sweep (0.9–5 MHz repeated at 1 kHz) at an intensity of only ~5% that of the Larmor frequency stimulus. The results point to the involvement of a radical pair mechanism, the first such evidence for a mammal, although further research is needed to provide a more thorough characterization of the underlying mechanism. The RF magnetic fields applied here have peak intensities below the ICNIRP guidelines for general public exposure (63, i.e., Brms = 0.92 µT/f [MHz], or Bpeak = 1.30 µT/f [MHz]) considered as harmless for human health. Yet, we show that they are sufficient to affect behaviour in a mammal. Fedrowitz, Maren. “Cows: A big model for EMF research, somewhere between Vet-Journals and “Nature”.” The Bioelectromagnetics Society, 2014. Slaby, P., K. Tomanova and M. Vacha. “Cattle on pastures do align along the North-South axis, but the alignment depends on herd density.” J Comp Physiol A, vol. 199, 2013, pp. 695-701. Hart, V., et al. “Dogs are sensitive to small variations of the Earth´s magnetic field.” Frontiers Zoology, vol. 10, no. 80, 2013. Eder, S.H.K., et al. “Magnetic characterization of isolated candidate vertebrate magnetoreceptor cells.” PNAS, vol. 109, 2012, pp. 12022-7. Cerveny, J., et al. “Directional preference max enhance hunting accuracy in foraging foxes.” Biol Lett, vol. 7, 2011, pp. 355-7. Hert, J., et al. “No alignment of cattle along geomagnetic field lines found.” J Comp Physiol A, vol. 197, 2011, pp. 677-82. Begall, S., et al. “Further support for the alignment of cattle along field lines: reply to Hert et al.” J Comp Physiol A, vol. 197, 2011, pp. 1127-33. Burda, H., et al. “Extremely low-frequency electromagnetic fields disrupt magnetic alignment of ruminants.” PNAS, vol. 106, 2009, pp. 5708-13. Begall, S., et al. “Magnetic alignment in grazing and resting cattle and deer.” PNAS, vol. 105, 2008, pp. 13451-5. Stelletta, C., et al. “Effects of exposure to extremely low frequency electro-magnetic fields on circadian rhythms and distribution of some leukocyte differentiation antigens in dairy cows.” Biomed Environ Sci, vol. 20, no. 2, 2007, pp. 164-70. Burchard, J.F., D.H. Nguyen and H.G. Monardes. “Exposure of pregnant dairy heifer to magnetic fields at 60 Hz and 30 µT.” Bioelectromagnetics, vol. 28, no. 6, 2007, pp. 471-6. Burchard, J.F., D.H. Nguyen and M. Rodriguez. “Plasma concentrations of thyroxine in dairy cows exposed to 60 Hz electric and magnetic fields.”Bioelectromagnetics, vol. 27, 2006, pp. 553-9. Nguyen, D.H., L. Richard and J.F. Burchard. “Exposure chamber for determining the biological effects of electric and magnetic fields on dairy cows.”Bioelectromagnetics, vol. 26, no. 2, 2005, pp. 138-44. Rodriguez, M., et al. “Blood melatonin and prolactin concentrations in dairy cows exposed to 60 Hz electric and magnetic fields during 8 h photoperiods.”Bioelectromagnetics, 25, 2004, pp. 508-15. Burchard, J.F., et al. “Lack of effect of 10 kV/m 60 Hz electric field exposure on pregnant heifer hormones.” Bioelectromagnetics, vol. 25, no. 4, 2004, pp. 308-12. Burchard, J.F., H. Monardes and D.H. Nguyen. “Effects of 10 kV, 30 µT, 60 Hz electric and magnetic fields on milk production and feed intake in nonpregnant dairy cattle.” Bioelectromagnetics, vol. 24, 2003, pp. 557-63. Rodriguez, M., et al. “Responses of the estrous cycle in dairy cows exposed to electric and magnetic fields (60 Hz) during 8-h photoperiods.” Anim Reprod Sci, vol. 77, no. 1-2, 2003, pp. 11-20. Broucek, J., et al. “Effect of low magnetic field on calves during prenatal development.” Tierärztl Umschau, vol. 57, 2002, pp. 241-8. Rodriguez, M., et al. “Effect of electric and magnetic fields (60 Hz) on production, and levels of growth hormone and insulin-like growth factor 1, in lactating, pregnant cows subjected to short days.” J Dairy Sci, vol. 85, 2002, pp. 2843-9. Broucek, J., et al. “Effect of low magnetic field on dairy cows.” Tierärztl Umschau, vol. 56, 2001, pp. 364-9. Burchard, J.F., D.H. Nguyen and E. Block. “Macro- and trace element concentrations in blood plasma and cerebrospinal fluid of dairy cows exposed to electric and magnetic fields.” Bioelectromagnetics, vol. 20, 1999, pp. 358-64. Burchard, J.F., D.H. Nguyen, E. Block. “Effects of electric and magnetic fields on nocturnal melatonin concentrations in dairy cows.” J Dairy Sci, vol. 81, 1998, pp. 722-27. Burchard, J.F., et al. “Effects of electromagnetic fields on the levels of biogenic amine metabolites, quinolinic acid, and beta-endorphin in the cerebrospinal fluid of dairy cows.” Neurochem Res, vol. 23, 1998, pp. 1527-31. Burchard, J.F., D.H. Nguyen and E. Block. “Progesterone concentrations during estrous cycle of dairy cows exposed to electric and magnetic fields.”Bioelectromagnetics, vol. 19, no. 7, 1998, pp. 438-43. Burchard, J.F., et al. “Biological effects of electric and magnetic fields on productivity of dairy cows.” J Dairy Sci, vol. 79, 1996, pp. 1549-54. Angell, R.F., et al. “Effects of a high-voltage direct-current transmission line on beef cattle production.” Bioelectromagnetics, vol. 11, no. 4, 1990, pp. 273-82. Algers, B. and J. Hultgren. “Effects of long-term exposure to a 400 kV, 50 Hz transmission line on estrous and fertility in cows.” Prev Vet Med, vol. 5, no. 1, 1987, pp. 21-36. Hillman, D., et al. “Relationship of electric power quality to milk production of dairy herds – Field study with literature review.” Sci Total Environ, vol. 447, 2013, pp. 500-14. Erdreich, L.S., et al. “Meta-analysis of stray voltage on dairy cattle.” J Dairy Sci, vol. 92, no. 12, 2009, pp. 5951-63. Hässig, M., et al. “Influence of non ionizing radiation of base stations on the activity of redox proteins in bovines.” BMC Vet Res, vol. 10, no. 136, 2014. Hässig, M., et al. “Prevalence of nuclear cataract in Swiss veal calves and its possible association with mobile telephone antenna base stations.” Schweiz Arch Tierheilkd, vol. 151, 2009, pp. 471-8. Löscher, W. “Survey of effects of radiofrequency electromagnetic fields on production, health and behavior of farm animals.” Prakt Tierarzt, vol. 84, no. 11, 2003. Wenzel, C., A.C. Wöhr and J. Unshelm. “The effect of electromagnetic transmitters on behaviour of dairy cows.” Prakt Tierarzt, vol. 83, 2002, pp. 260-6. Löscher, W. and G. Käs. “Behavioral abnormalities in a dairy cow herd near a TV and radio transmitting antenna.” Prakt Tierarzt, vol. 79, 1998, pp. 437-4. Stärk, K.D., et al. “Absence of chronic effect of exposure to short-wave radio broadcast signal on salivary melatonin concentrations in dairy cattle.” J Pineal Res, vol. 22, no. 4, 1997, pp. 171-6.